Paid for by businesses in the Bedford Business Improvement District (BID) this new service gives the smallest independents access to social media (SM), as well as larger High Street names, navigated by expert Ross Testa of Yakety Yak. Ross can be seen on his own SM with Lord Sugar and Sir Richard Branson, but is local to Bedford. 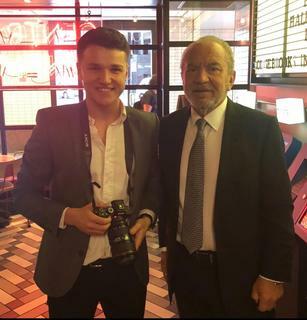 Ross with Lord Sugar – not so much an Apprentice as an Advanced Social Media operator sharing with expertise for the benefit of Bedford businesses | Ross (right) filming BBC filming at Bedford earlier in the year. Keeping the coverage reaching the widest audience. “We plan to add some rocket fuel into the social media of Love Bedford which will help the town and the businesses lift off to reach a wider and wider audience. I will do this by accessing the latest opportunities offered by FB which move so fast that day to day users can’t keep up,” said Ross, aged 21. The Love Bedford platforms already include the widest read website which showcases the town centre www.lovebedford.co.uk, Love Bedford on Instagram - the choice of teenagers and twenties, and Twitter. Nicola Harris is a professional actress who has made her bridal shop George James Bridal in Bromham Road a destination venue and in the process won a shelf of prestigious awards. Most recently she has added Hattie & Co, a tiny shop for tiny tots in the Edwardian Arcade off the High Street to her retail range, stocking designers worn by Royal Family children. Director of BedfordBID Christina Rowe said: “We are extremely lucky to have on our doorstep a young man who is really in the national premier league of social media management for businesses, coupled with the decades of local business expertise of his partner (and Dad) Roy Testa. The combination is too good a chance to miss to help us lift Love Bedford up and into the stratosphere of social media. This is such a fast-moving technology that most of our independents, and even some of the larger companies, can’t keep up. “Only via the BID can businesses can pull together resources to access the very latest opportunities to push themselves on to people’s screens.